The Omega Seamaster has been one of the world's most famous diving watches for decades. The collection contains numerous models with retro designs as well as state-of-the-art tool watches. There is also a vast selection of vintage watches. The Seamaster collection is the oldest Omega series still in production. It has existed under this name since 1948. One hundred years before the Seamaster's debut, the Swiss manufacturer's founder, Louis Brandt, began producing and exporting watches. In 1932, the company presented their first diving watch, the square-shaped Marine. This was the precursor to the Seamaster series. Omega has continually expanded the series over the years. In addition to the Seamaster 300, the series is home to the Planet Ocean 600M, the Aqua Terra 150M, the Diver 300M, the Bullhead, and the Ploprof 1200M. Each model is its own unique addition to the Seamaster family. Whether you're sailing, surfing, snorkeling, or kayaking, you'll be set with a watch from the Seamaster series. All models can endure at least 15 bar of pressure. Most models, however, can withstand even more. Recreational or professional divers should look to watches that can cope with 20 bar or more, as those are solid, functional underwater watches. The rule of thumb is that the Aqua Terra models and the Bullhead can withstand up to 15 bar (150 m, 492 ft), while the rest of the newer Seamaster models can go even deeper. 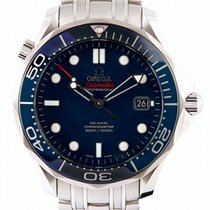 How much does a Seamaster cost? Today's Seamaster 300 pays homage to its namesake models from the late 1950s. However, it differs in design from the Diver 300M, which has a similar name but goes better with a diving suit. The Seamaster 300, on the other hand, can also pass as a sporty dress watch, even with its diving watch features. These include water resistance to 300 m (984 ft), a rotatable bezel, and glow-in-the-dark hands. This 41-mm watch is available in stainless steel, various gold alloys, titanium, or platinum. Depending on the material, plan to spend between 4,500 and 23,200 USD on a new Seamaster 300. 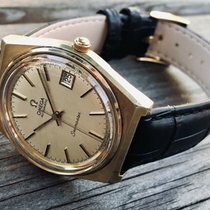 If you're more interested in a vintage model from the 60s, expect to pay around 9,100 USD for a timepiece in good condition. One special detail makes it clear that the Seamaster Professional Diver 300M is meant for professionals: the helium escape valve. It is located on the case at 10 o'clock and helps protect against any damage potentially caused by helium entering the watch during saturation dives. Omega offers the three-hand edition in three sizes: 28, 36, and 41 mm. While the two larger models feature automatic movements, the smaller version is powered by a high-precision quartz movement. The 28-mm watch also does without the helium escape valve, bringing its price down to an affordable 1,600 USD. At 3,100 USD, its larger sisters are almost twice as expensive. In addition to the three-hand models, the Diver 300 is also available as a chronograph with or without a GMT function. Set aside about 4,200 USD for the 41-mm chronograph. The 44-mm version with a second time zone costs a good 700 USD more. The Seamaster Planet Ocean is still a relatively new addition to the Omega catalog. Introduced in 2005, it has since developed into a large collection of diving watches, each water resistant to 600 m (1,969 ft). These watches also feature a helium escape valve at 10 o'clock and look like a modern interpretation of the Seamaster 300. You can choose from models with three hands, a chronograph function, or both chronograph and GMT functions. What's more, you have to decide if you want a stainless steel, gold, ceramic, or titanium timepiece and whether you're willing to pay more for a model with an especially anti-magnetic Master Chronometer movement. The three-hand models are the most affordable. A 37-mm piece in titanium costs approximately 4,500 USD. Prices for the 43.5-mm Master Chronometer edition sit around 4,900 USD. Expect to pay about 5,800 USD for a stainless steel Planet Ocean with a second time zone, while the version with a ceramic case demands 8,500 USD. On the other hand, a titanium chronograph model costs about 7,700 USD. Timepieces with gold cases sit at the top of the price range. Anticipate prices of around 15,900 USD for a three hand model and 22,700 USD for one with a chronograph function. 'Ploprof' stands for plongeur professionnel, which is French for 'professional diver,' and the Seamaster Ploprof is a professional instrument in more than name alone. Two things stand out in addition to its dimensions – 55 x 48 mm – and angular design: the crown at 9 o'clock surrounded by a massive crown protector and the diving bezel with a security pusher at 2 o'clock. With a water resistance of up to 1,200 m (120 bar, 3,937 ft), current models easily meet professional requirements. Prices for a stainless steel Ploprof 1200M come in at around 7,100 USD. If you prefer the version with a titanium case, the price rises to almost 9,000 USD. Bicolor models in titanium and sedna gold demand an additional 4,100 USD. Fans of vintage watches will find just what they're looking for with the Ploprof 600 from the 70s. As its name suggests, this timepiece is water resistant to 600 m (60 bar, 1,969 ft). You can purchase a model in good condition starting around 8,800 USD. The Seamaster Aqua Terra is probably the most elegant member of the Seamaster family. With its simple, linear design, this diving watch can easily pass for a dress watch, despite being water resistant to 150 m (15 bar, 492 ft). Three-hand watches make up the majority of this collection, though you will find chronographs and watches with a second time zone as well. Omega even offers special editions for women in their Ladies' Collection. Master Chronometer movements have been powering the Aqua Terra since 2017. Before that, the series featured both automatic and quartz calibers. You can get one of the quartz models for as little as 1,100 to 2,100 USD. Prices for older three-hand models with an automatic movement begin around 2,700 USD, while the current models start at about 4,300 USD. If you'd like to call an Aqua Terra with a chronograph function your own, be prepared to spend about 4,200 USD. Be sure to add another 2,300 USD on top of that for a chronograph with a second time zone. With gold and diamonds, that price climbs to between 11,000 and 15,000 USD. The Seamaster Bullhead is a coveted collector's item. Two push-pieces flank the main crown at 12 o'clock on top of the wedge-shaped case, giving the watch the look of a bull's head. Another peculiar crown sits at 6 o'clock and is used to operate the inner bezel. This unusual chronograph was first introduced in 1969. After many years silently developing a cult following, many watch enthusiasts rejoiced when Omega reintroduced the Bullhead almost entirely unchanged in 2013. The new edition costs around 7,000 USD, while well-maintained examples from 1969 sell for about 11,000 USD. Collectors may also be interested in the limited edition models, such as the one dedicated to the 2016 Olympic Games in Rio. You can call this timepiece your own for approximately 8,800 USD. Even though the Railmaster isn't a diving watch, it's still part of the Seamaster family. When Omega first presented this timepiece in 1957, it was mainly aimed at people whose work included regular exposure to strong magnetic fields. Magnetic fields can have a major effect on a watch's functioning. Omega solved this problem by housing the movement in an internal cage made of soft iron, which protected it against magnetic fields of up to 1,000 Gauss. Thanks to their Master Chronometer movements, current models can resist up to 15,000 Gauss . The Railmaster only comes as a three-hand timepiece in stainless steel – a reflection of its purpose as a functional and reliable tool. Plan to spend around 4,000 USD on a new, 40-mm edition. The limited 1957 Trilogy series also features a Railmaster, which is very similar to the original model. This timepiece costs about 6,600 USD. You'll have to spend significantly more if you're looking for a model from 1957. Prices for these pieces usually sit around 15,700 USD. Omega uses predominantly mechanical calibers with Co-Axial escapements in their Seamaster models. One advantage of this technology is that the mechanism causes less friction and therefore, can function with less lubrication. Furthermore, it has the same jolt resistance as a regular escapement does. Omega uses reliable calibers from the movement manufacturer ETA and develops them further under their own name. According to watch expert Robert-Jan Broer of Fratello Watches, Omega's calibers can now be considered in-house. Aside from the mechanical watches, Omega also offers a few versions of the Seamaster with quartz calibers, such as the Diver 300M for women with a diameter of 28 mm. The Aqua Terra 150M series has quartz watches for both men and women. The Marine was the first watch series designed specifically for underwater use. The Rolex Oyster from 1926 was water resistant but was not designed as an underwater watch. In May 1937, the Swiss horological laboratory confirmed that the Marine could withstand pressure up to 13.5 atm, or a depth of about 135 meters (443 ft). This confirmation was also a first, as laboratory experts had never before issued such a certificate. The Seamaster was initially planned to be a plain, all-purpose men's watch with improved water resistance. However, this changed in 1955, when it truly lived up to its name. Diver Gordon McLean wore the Seamaster on his wrist to a depth of 62.5 m (205 ft) in Australian waters, and it withstood the dive undamaged. A new innovation at the time was the rubber O-ring, which replaced the use of lead or shellac. In 1956, Omega sent the Seamaster on a polar route over the North Atlantic attached to the outside of a Douglas DC-6 aircraft. One year later, the Biel-based manufacturer introduced the Seamaster Professional, a version that continues to be produced today. The Seamaster 300 quickly gained a good reputation among professional divers. Many divers from the civil and military sectors chose to wear this watch, as well as the UK Royal Navy's Special Boat Service. Oceanographer Jacques Cousteau used the Seamaster in 1963 during his experiments with the underwater station Precontinent II off the Sudanese coast in the Red Sea. There has since been a competition to create the best diving watch: Omega's Seamaster, Blancpain's Fifty Fathoms, and Rolex's Submariner are all contenders. Of course, there will never be an objective winner because personal preference plays such a large role. In 1970, Omega added the Seamaster 600 to its collection. The watch functioned up to a simulated depth of 1,370 m (4,495 ft) in laboratory tests. It finally stopped working because the water pressure warped the 4-mm thick glass so far inwards that it impeded the second hand. At such depths, the pressure amounts to 140 kilograms (309 lbs) per square centimeter. Outside the laboratory, the larger 600 model, the Seamaster 1000, reached a depth of 1,000 m (3,281 ft) while attached to a robotic arm of the Beaver Mark IV submarine. Seamaster watches were used to time many free diving records in the 1980s and 90s. The most well-known Omega Seamaster wearer is British secret agent James Bond. In the 1995 film GoldenEye, Pierce Brosnan wore a Diver 300M with a blue dial. GoldenEye marked the debut of both Brosnan and the Seamaster in the Bond series. Daniel Craig, Brosnan's successor, has remained loyal to the series. In the 2015 film Spectre, Agent Bond undertakes his mission while wearing two different Seamaster watches. The first, the 300, was introduced by Omega as a special limited edition in conjunction with the film. Only 7,007 watches were made. They can be recognized by their gray and black striped NATO fabric strap and 41-mm stainless steel case, as well as the black rotating bezel made of ceramic and a special alloy called Liquidmetal. Bond also wears an Aqua Terra 150M in Spectre. Both watches feature a Co-Axial caliber.